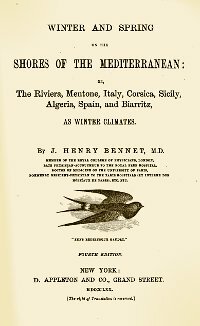 A Manchester doctor, James Henry Bennet, established Menton's popularity with the sick by publishing Winter and Spring on the Shores of the Mediterranean in 1861. It ran to many editions and translations. Bennet himself had come "to die in a quiet corner", so he was living proof of the climate's effects. When Bennet first arrived in Menton it was a small town in a sheltered bay which grew, and exported lemons. By the time Mansfield came to live there, it had 75 hotels, two Anglican churches and one Presbyterian, tramways, tennis clubs and hundreds of palm-surrounded villas that spread east to the new suburb of Garavan and the Italian border.